St Tropez, Miami, Porto-Cervo, Monaco, Palm Beach, Ibiza, Dubrovnik, Acapulco, St Barth, Cannes, Capri… whatever your playground, the 428 Gladiator is the ultimate “Must Have” day-cruiser. No need to disembark from a super-yacht to arrive in style! The fit and finish in every details are the exact same as our much larger yachts. From the paint job to the hardware and equipment, everything is state-of-the-art. Since 1946, Canados delivers only the best. This beautiful Italian designed 42' Canados Gladiator 428 made her U.S. debut at the Miami Yacht Show 2018. A sleek, new model with upgrades that are sure to wow the crowd! See listings for Open Outboard Model and Diesel Models. The 428 Gladiator will take you anywhere in the utmost comfort. The ride is surely the softest you've ever experienced. The naval architecture is not the only determining factor that makes the Gladiator the best boat in the category. The high tech construction process using only the best components and equipment, makes it THE day cruiser "par excellence". The outdoor space makes it the ideal platform for family and friends while cruising, anchored at the beach or for trips to the Bahamas. Its large aft walk-around sun pad provides discrete storage for Seabobs. The table and lounge sofas fore of the helm station, provide ample seating for socializing and entertaining. Everything has been designed for fun and safety with a true luxury feeling. You will enjoy the user-friendly technologies incorporated in our extensive standard package. The 16 inch touch-screen “Crystal Cockpit” allows controlling the entire boat including engines parameters, autopilot, depth sounder, chart plotter and sound system. Our standard control package includes a powerful bow thruster that can either be controlled independently or via a maneuvering joystick connecting it with the drives. The carbon fiber dashboard will leave your friends breathless. The helmsman’s experience is enhanced by the two lounge-sofas forward allowing for a real social life when steering the boat. The entire cockpit is protected by the two Speedster styled laminated glass windshields and a carbon fiber hard top. The LED lighted control switches commanding all the organs of the boat are participating in giving a hightech atmosphere. Roman designer Marco Casali is responsible for the 428 Gladiator stunning timeless design. Casali managed to give the boat a posh, aggressive and above all practical design, including the custom hand made interiors build from the finest wood veneers and components by our artisans. Thanks to its 13'9" beam at the windshields base, the cabin is wide and comfortable, allowing for a good night sleep or a comfy afternoon nap. The bathroom is also roomy and nice with its skylight and easy maintenance concept. As part of the standard, the hull of the Gladiator 428 is painted with a choice of 15 custom colors made for Canados by Dupont®. If you have a specific lucky color, we can offer, as an option, a choice of over 400 different colors, flat or metallic. The deck comes in light premium grey gelcoat. Here too, you can customize your Gladiator by painting the deck and cockpit furniture to the color of your choice. We offer unlimited color combinations with 5 different painted zones so your boat can be truly unique. The synthetic high-tech teak deck can be chosen from 8 different colors as well as the external upholstery which attention to details and stitching will blow you away. The Gladiator 428 is the only boat that size which entire cockpit architecture has been designed step less. It is surely an aesthetical factor of the best effect when looking at the boat from stern, it is also a major advantage in terms of comfort. Kids and guests are able to move around the entire cockpit, even in rough water navigation, without any risks of missing a step. This concept also optimizes the usable space, which you will really enjoy when the boat is at anchor. Accessing the foredeck is not any more reserved to tightrope walkers. The central integrated stairwell makes the foredeck easily accessible. In short, the Gladiator 428 brings glamour, luxury and performances into a reasonably sized day-cruiser. 528 gal. approx. gas tanks with two AISI 316L stainless steel race styled filling caps. 79 gal. polyethylene fresh water tank. 40 gal. approx. diesel tank for generator with one AISI 316L stainless steel race styled filling caps. 12V DC ship’s service throughout. 3 x Service AGM Exide Equipment GEL batteries ES 1300 - 12V - 120 Amps. 3 x AGM Exide Start batteries EM 1100 – 100 Amps dedicated to Bow thruster. Black water circuit with Whale Gulper Toilet 12 V with anti-odor filter. Grey water circuit with direct discharge pump Vetus GWDS 12 V.
2 x Automatic Rule 1500 bilge pumps. 2 x Whale 50 manual bilge pump. 2 x through hull dynamic air intakes with Feit water separators (hull sides). 2 x bilge blowers Jabsco. 2 x Hydraulic pumps feeding the trim tabs. 40 liter water heater Isotemp Indel Webasto 40. Electrical circuit 12 Volts / 120 Volts 60 Hz. High performance sound proofing panels on the sides and under the deck. 2 x Battery chargers with thermal cutoff and switching system. 2 x 120 volts power outlets. Pyroff automatic fire extinguishing system with override control at the dashboard. Battery distribution panel with battery switches and parallel system for main engines. Master electrical control panel located in the cabin with 12V/120V breakers and gauges for power supply, voltmeter and amp-meter. Zincs on transom and trim tabs. Composite custom built engine bracket. Stainless steel gas pistons for the deck hatch and chain locker accesses. 20 kg Stainless Steel Bruce anchor. 40 meter galvanized 8mm chain. Maxwell RC8-8 electrical windlass with built-in stainless steel bow roller andn manual safety hook. Deck hatch access to windlass and chain locker. Chain locker drain with outboard discharge. 2 x Pop-Up AISI 316 L stainless steel cleats (Foredeck). 2 Pop-Up AISI 316 L stainless steel cleats (amidship). Central AISI 316 L Stainless Steel fairlead (Foredeck). 2 x Pop-Up AISI 316 L stainless steel cleats (Aft). 2 x protection stainless plates surrounding aft cleats. Custom made Canados AISI 316 L Stainless Steel rub rail around the boat excluding the swim platform. 2 x Quick release pin cleats for fenders – one each side (Foredeck). 1 x flush mounted openable deck hatch with built-in drainage. 2 x Café Racer styled windshields with AISI 316 L stainless steel structure. 2 x custom made AISI 316 L Stainless Steel side hand rails. 1 x Race styled AISI 316 L Stainless Steel Fuel fills for generator diesel fuel tank. Race styled AISI 316 L Stainless Steel fresh water fill. AISI 316 L Stainless steel black water discharge cap. AISI 316 L Stainless steel towing eye at bow. Sliding Plexiglas cabin door mounted on aluminum rails. Foredeck access steps in composite with Flexiteek synthetic teak decking. Two built-in L shaped sofas/lounges with cushions and fenders storage underneath. Center console / Dash Board with Crystal engine and electronics display mounted on stainless steel base. Deck hatch access to central storage located in front of the center console. Helm bench with foldable bases. Kevlar/Carbon fiber hard-top painted in Dupont® flat black paint or in custom formulated Dupont® painting for Canados-Gladiator in solid color. 4 x painted stainless steel hard top legs. Combo Navigation/Mooring lights Lopolight 200-007S. VHF antenna painted in black or in hard top color. 12 V Khalenberg electro-pneumatic horn. AISI 316 L Stainless steel flag mast. 4 x recessed in hard top LED spotlights. 2 x recessed in hard top Red LED spotlights above dashboard. 2 x Portable fire extinguishers. Sun pad’s forward part is equipped with a folding backrest on a stainless steel arms. 2 x side furniture, one with a 65-liter fridge and sink, the other with double burner glass ceramic hob by Techimpex. 10 x Cockpit Courtesy LED lights. 2 x AISI 316 L Stainless Steel gates on the sides of the sun pad. Engine air outlets on the side of the sun pad. Name plate recessed in the aft vertical cushion of the sun pad. Name of the boat in adhesive. Carbon fiber 4 steps (3,5kg) – removable swim ladder. Recessed bulwark shower with hot and cold water. Shore power socket with 10 meter shore power cord. 2 x AISI 316 L Stainless steel towing eyes. Full walk-around Center Console with reversed windshield/air deflector and wrap-around stainless steel handrail. Built-in recessed foot rest for helmsman. Isotta Carlotta ST Steering wheel or equivalent. Simrad Crystal integrated cockpit with 19” screen. Simrad GSD 24 GPS chart plotter module 50/200 Khz integrated in the crystal cockpit. Simrad depth sounder module integrated in the crystal cockpit. Fusion sound system AV650 with amplifier AM504 and with 4 waterproof Speakers and Subwoofer. Sound system can we controlled from the Crystal Cockpit and via Bluetooth from a smart phone application. Fuel and fresh water level gauges. 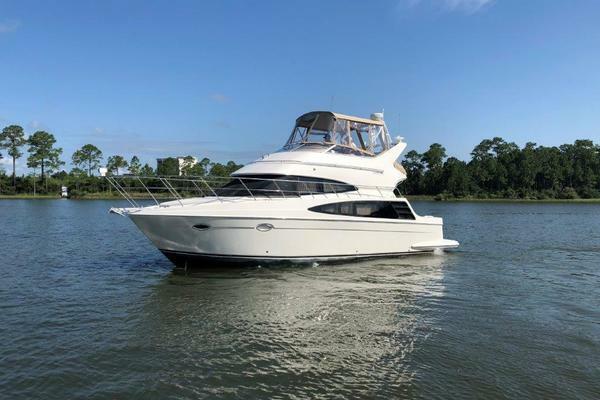 Switches for courtesy lights, navigation lights, mooring lights, red overheads lights, bilge pumps, blowers, engine hatch opening system, horn, engines start, water pump, fridge and accessories. Floor in Bamboo in the cabin. L shaped sofa/lounge with storage below and high gloss table. Ceiling panels upholstered in Poltrona Frau leather. Blackout shield for skylight and hatch. 2 x 120 Volts sockets and 2 USB sockets. Fusion sound system with #2 speakers. Wall mounted watch, Barometer and hydrometer. Kitchenette with built in sink. Kitchen drawer and storages with wood doors with custom made Corian top and sink. Bathroom with wooden access door, sink, shower cabin, Tecma electric toilets, built-in furniture, soap, toilet paper and toilet brush holder, storage, extractor, mirror, floor in Flexiteek synthetic teak, LED spotlights and 2 x 220 Volts power outlets. All furniture custom made at Canados. Outer skin is made of Vinyl Ester offering the highest resistance to Osmosis blistering and UV. First layers of the outer skin coat are laminated by hand. Further lawyers are laminated using vacuum bagging process to offer optimal resistance strength and weight control. Under the waterline level, hull is laminated using Biaxial (cross to 90°) E-Glass with a Balsa coring to offer maximum impact resistance. Above waterline, the lamination is made of E-Glass sandwich with Balsa offering high strength, rigidity and lightness using infusion process. Hull is painted with two coats of custom formulated Dupont® painting for Canados-Gladiator in solid color. Both are laminated with E-Glass infused with Vinyl Ester resin and Airex closed cell foam coring offering superior stiffness, sound and thermal proofing. Deck and exterior furniture in gel coat. Separation bulkheads for the engine room and the forward storage separating the cabin are Vacuum bagged. Structural built-in Fuel and water tanks are made of infused monolithic fiberglass of a minimum 1 cm/ thickness. Hard top is made of Kevlar/carbon fiber infused with Vinyl Ester resin painted with two coats of custom formulated Dupont® painting for Canados-Gladiator in solid color. Hard top legs are made of stainless steel painted in black. Under the waterline, the Gladiator is delivered with two quotes of primers, ready to apply antifouling paint. Hull is post-cured. Radar antenna Simrad 18 XHD 4kW 18 NM range. Ice Maker in the cockpit with separate water tank. Barbecue or Grill in AISI 316L stainless steel located in the cockpit (electric). Aft cockpit micro-perforated Awning with 2 Carbon fiber poles with tensioners. AISI 316 L Stainless steel and carbon fiber removable and foldable shower pole with quick connection for hot and cold water. 2 x SeaVision under water lights SV20 LED 4,400 lumens.